Maine, The Way Summer Should Be. For a memorable weekend or even an entire summer of old fashioned fun, there is no better place to be than Maine in the summer. A leisurely walk along the rugged, picturesque coastline can lead out to a point where you might discover a lighthouse, a hidden cove or a spectacular view. Let me show you how I spend my summers and perhaps you will want to plan a trip to see Maine for yourself. To see Maine from the air, you can be adventurous and take a ride in an open air biplane, I can attest that it is a real thrill. Perhaps you would prefer a seaplane, taking off and landing in one of the many lakes in Maine. Which ever is your choice, the view is terrific. 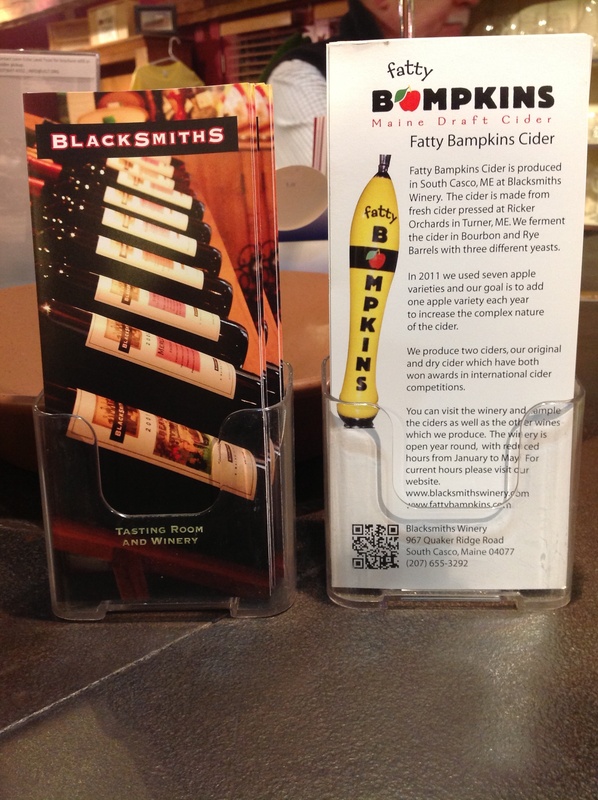 Today, I’m following up my post on Blacksmiths Winery with a post about craft beer and a great opportunity to enjoy it, and the great city of Portland, this weekend at The Festival. Brought to you by the Shelton Brothers, The Festival features three tasting sessions with brews and brewers from all over the world. What makes this festival different (and worth the ticket price) is that it focuses on showcasing small, craft brewers and cideries from all over the world – and the people who make them will actually be there to meet you and talk with you. In addition, session attendance is limited to no more than 1,200 people per session, so you’re less crowded and the brewers have more time to talk with you. The sessions begin tomorrow, June 21st, with Session 1 running from 6:30pm – 10:30pm, and Sessions 2 and 3 on Saturday, June 22nd, from 1pm – 5pm and 6:30pm – 10:30pm, respectively. The event is being held at the Portland Yacht Services Building, 58 Fore St., Portland, Maine. Among the brewers participating, there are several local businesses: Maine Beer Co, Maine Mead Works, Allagash (a personal favorite! ), Oxbow, Rising Tide, Bull Jagger, and Marshall Wharf. 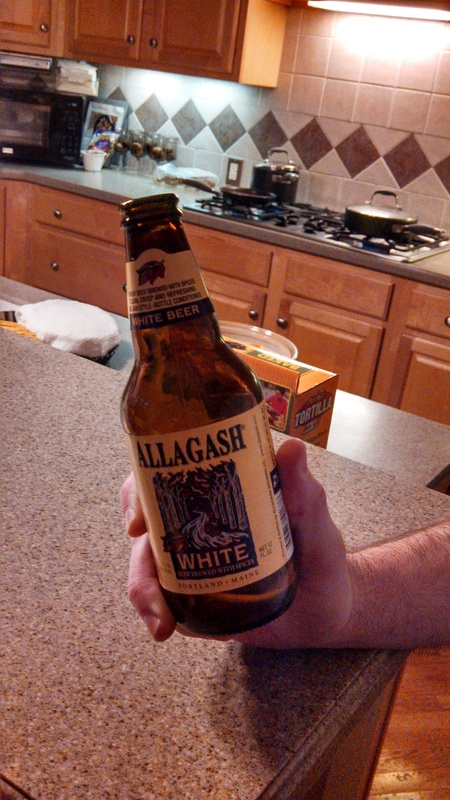 Food vendors include The Thirsty Pig (a favorite of my mom’s – and eventually, a topic on this blog), Bite Into Maine, Pizza Pie on the Fly, Hella Good Tacos, Binga’s Wingas, and Small Axe. For more information, check out this great article from the Portland Press Herald, by Meredith Goad, or visit the event website. I only wish I had known about this event sooner! Keeping track of it for next year (even if it’s not in Maine)! Categories: Drink, Eat, Play, Shop | Tags: alcohol, Allagash, beer, Blacksmiths Winery, brewers, cider, craft beer, Maine, Portland, The Festival, The Thirsty Pig | Permalink. Over the last decade, the popularity of wine has grown rapidly throughout the US. A well-loved beverage throughout human history, wine does carry an intimidation factor – those who don’t know much about it have simply avoided it in the past – rather than being forced to discuss flavors of pear and citrus, or smoke and plums, with their wine-wise friends. From my perspective, one of the benefits local wineries and vineyards offer to those formerly intimidated by the world of wine is an accessible, relaxed atmosphere in which to try it and learn about it. Maine has not been immune to the wine fervor, with vineyards and wineries popping up around the state. I hope to visit more of them in the future, but this post is all about Blacksmiths Winery and my experiences there at wine tastings. It’s no secret that Nick and I enjoy a good glass of wine, and my mom actually introduced us to Blacksmiths on Nick’s first trip to Maine with me more than four years ago. Nick knows much more about wine than I do, and he is the person who taught me most of what I know. Our first venture into Blacksmiths was a great experience. Located in South Casco, Maine, we headed there from my parents’ home on Sebago Lake to pick up some wine for Thanksgiving dinner (and of course, enjoy a tasting!). 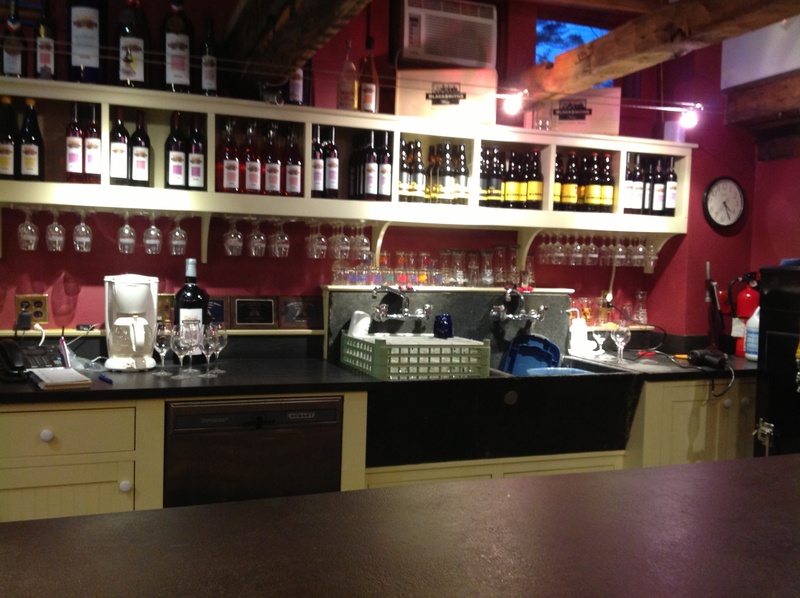 The tasting room space is charming and rustic – the decor very fitting for a New England winery – and includes a gift shop space with wine-themed items for purchase. From the colonial exterior to the comfortable, warm ambience inside, I enjoyed everything about my first, second, and ongoing experiences at Blacksmiths Winery. This is a great spot to stop for a bachelorette party, girls’ (or guys’) night out, a family visit (they have soda for the under 21s), and more. Their beverage list is quite extensive and has grown in recent years. On my first visit, they offered soda and wine, but most recently, I saw that they are also offering hard ciders under the brand Fatty Bampkins. So far, I’ve stuck with the wines, and primarily the French varietals at that, but I think next time I’ll give the ciders a whirl. Of the wines I’ve tried, the Merlot and Cabernet Sauvignon are my favorites. They make a big, flavorful Cab, with a strong smoky taste – really perfect for a steak or roast. As ice wines go, I thought their Vidal Ice Wine was outstanding. I prefer dry wines over sweet, but with this dessert wine, you don’t even need the dessert itself. It’s that good! 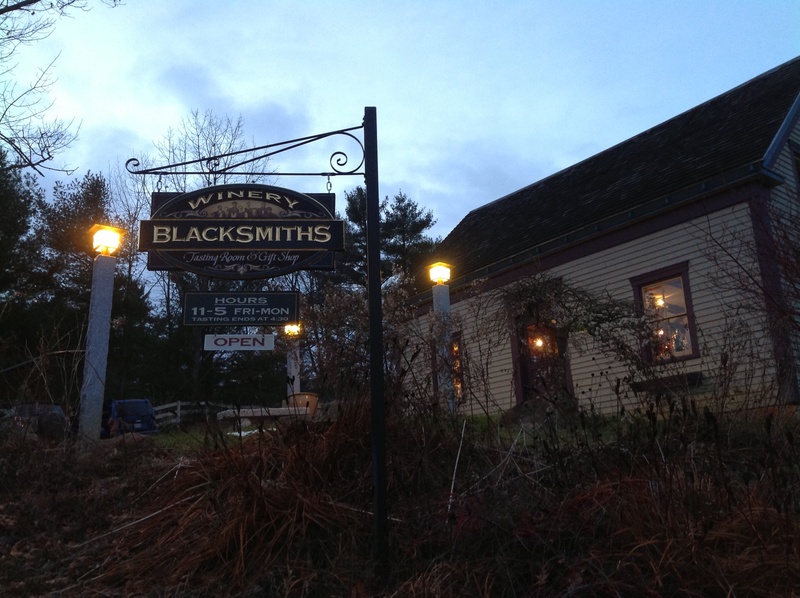 I hope you’ll make time to visit Blacksmiths on your next visit to that part of Maine – I can assure you won’t regret it. They also offer shipping to 19 states (see list here) and use vinoshipper.com. They ship to NC, so I do see a purchase in my near future! 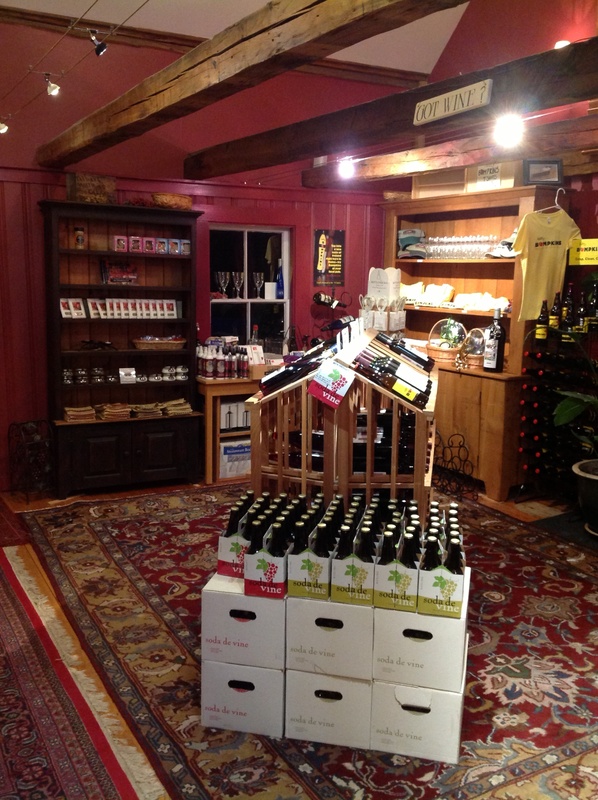 Categories: Drink, Eat, Shop | Tags: Blacksmiths Winery, Casco, cider, Fatty Bampkins, fun, Maine, outings, soda, wine | Permalink. Brace yourselves for an onslaught of salad recipes! There is something about these early days of summer that makes me crave a crisp, refreshing salad (and it has nothing to do with the beginning of bathing suit season). Frankly, I should be eating more salad and other leafy greens year round, but my own early-summer cravings, in addition to my husband’s request that we eat a bit lighter (hmm, do you think I make too much pasta? ), led me to peruse my Maine cookbooks in search of some delicious, exciting salad recipes. They didn’t disappoint. 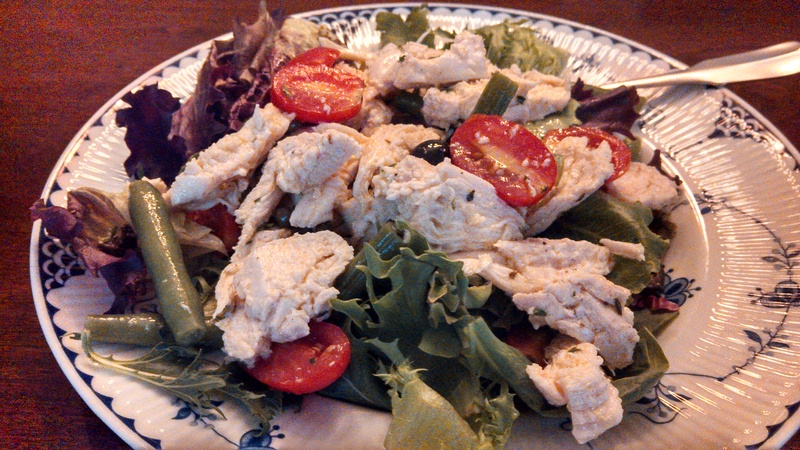 If you’re thinking, ‘a Mediterranean Chicken Salad recipe from Maine? Yeah right,’ you do have a point. I pulled this recipe from my Maine Home Cooking cookbook, under the Modern Maine Cooking section. In an introductory paragraph, Sandra Oliver acknowledges that many of the recipes in that section are a reflection of outside influences, both international and national. Maine home cooks, like cooks elsewhere, want to experiment at home with the recipes they’re able to try at restaurants. The following recipe serves 3 to 4 people. Because Nick and I certainly don’t need to consume an entire chicken between us (and I’m not a big fan of salad leftovers – in my opinion, the greens just don’t keep well), I poached a couple of chicken breasts in a broth with onion, several peppercorns, and some white wine. After it was cooked, I shredded it for use in the salad. I also think a rotisserie chicken would be a delicious and speedy answer for cooks who would rather not undertake cooking the chicken themselves. Pull the meat from the bones, cut into bite-size pieces, and put them into a bowl. Snap the beans and blanch them in hot water or cook until tender – your choice (I simmered mine until they were slightly tender, but retained a little bit of crunch). Add them to the chicken. Sprinkle capers on to taste, add the olives, slice the tomatoes in half (if you wish), and add them. 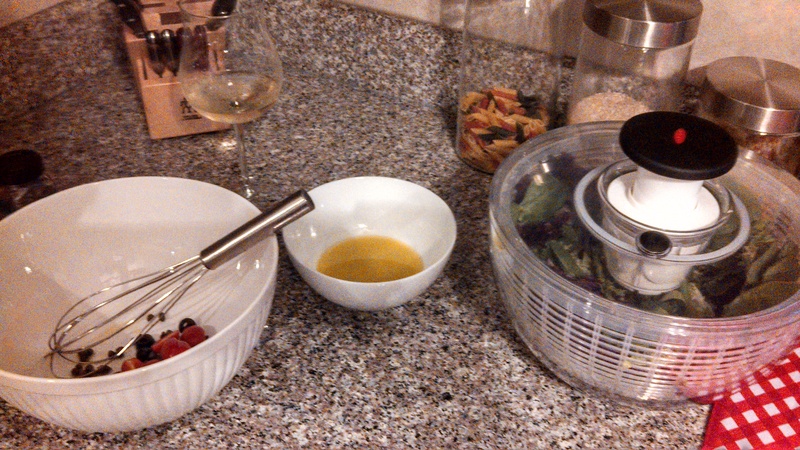 In a small jar, shake the olive oil and lemon juice together and dribble over the salad to taste. Sprinkle on some dry oregano, parsley, and add salt and pepper to taste. Let rest at room temperature. Serve the salad on the lettuce or greens. 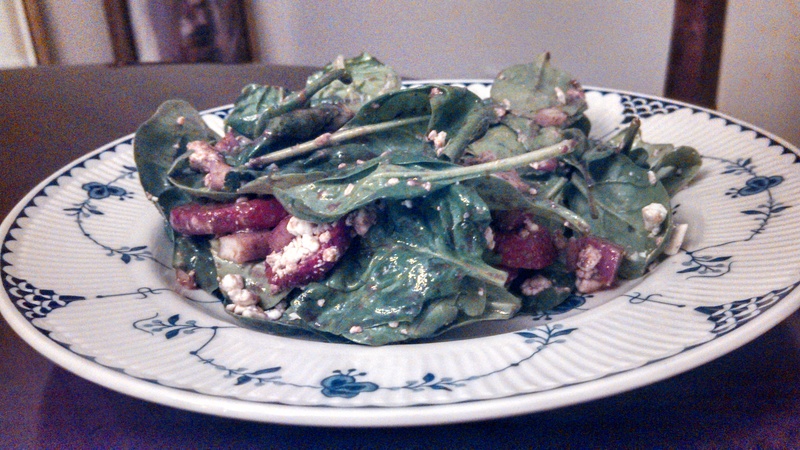 This salad was every bit as good as I imagined it would be when reading the recipe. Personally, I love the caper and lemon flavors, and with the addition of chicken, it was a light but filling meal that really hit the spot. I hope you enjoy it as much as we did! Categories: Drink, Eat, Weekly Recipe | Tags: capers, chicken, greens, lemon, Maine recipe, mediterranean, salad, tomatoes | Permalink. In lieu of a post today, I want to direct you to a Portland Press Herald article I read and enjoyed this morning. Written by Meredith Goad, Staff Writer, this piece, with the headline “Portland’s hardest-working chef piles more on his plate,” is all about Harding Lee Smith, owner of the popular “Room” restaurants. Personally, I very much appreciated Goad’s balanced approach to telling Smith’s story – covering not only how his upbringing and youthful experiences contributed to his current and future success, but also the ways in which the negative press has dogged him at times. I would say his success speaks for itself, and I wish him all the best with this new endeavor. I hope you enjoy this article as well, and I know I’ll certainly be visiting one of Smith’s restaurants during my next trip to Maine! Categories: Drink, Eat | Tags: chef, Harding Lee Smith, Maine Sunday Telegram, Meredith Goad, Portland Press Herald article | Permalink.